Mattick ponders the then-recent events of May 1937 - when the counter-revolutionary consequences of the CNT and POUM's compromises with bourgeois democracy and Stalinism became deadly reality. 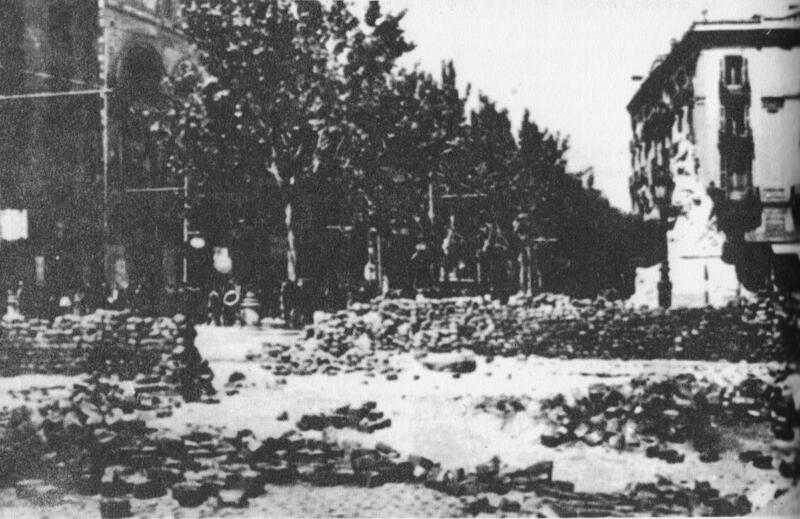 On May 7, 1937, the CNT-FAl of Barcelona broadcast the following order: "The barricades must be torn down! The hours of crisis have passed. Calm must be established. But rumors are circulating throughout the city, contradicting the reports of a return to normality such as we are now issuing. The barricades are a contributing factor to this confusion. We don't need the barricades now that fighting has stopped, the barricades serve no purpose now, and their continued existence might give the impression that we wish to return to the previous state of affairs - and that is not true, Comrades, let us cooperate for the reestablishment of a completely normal civil life. Everything that hinders such a return must disappear." And then began the normal life, that is, the terror of the Moscow-Fascists. Murder and imprisonment of revolutionary workers. The disarming of the revolutionary forces, the silencing of their papers, their radio stations, the elimination of all positions they had previously attained. Counter- Revolution triumphed in Catalonia, where, as we were so often assured by the anarchist leaders and these of the POUM they were already on the March towards socialism. The counter-revolutionary forces of the People's Front were welcomed by the anarchist leaders. The victims were supposed to hail their butchers. "When an attempt was made to find a solution and reestablish order in Barcelona", we read in a CNT bulletin, "the CNT and FAI were the first to offer their collaboration ; they were the first to put forward the demand to stop the shooting and try to pacify Barcelona. When the Central government took over public order, the CNT was among the first to put at the disposal of the representative of public order all the forces under its control. When the Central government decided to send armed force to Barcelona, in order to control the political forces which would not obey the public authorities, the CNT was once more the one to order all the districts to facilitate the passage of these forces, that they might reach Barcelona and establish order". Yes, the CNT has done the utmost to help to carry the Valencia Counter-revolution into Barcelona. The imprisoned workers may thank their anarchist leaders for their confinement, which ends before the firing sounds of the Moscow-Fascists. The dead workers are removed together with their barricades; they were silenced so that their leaders might continue to talk. What excitement on the part of the neo-Bolsheviks : "Moscow has murdered revolutionary workers", they shout. For the first time in its history, the Third International is shooting from the other side of the barricades. Before this time it had only betrayed the cause, but now openly fighting against communism." And what did these angry shouters expect from state capitalist Russia and its Foreign Legion? Help for the Spanish workers? Capitalism in all forms has only one answer for workers opposed to exploitation: murder. A united front with the socialists or with the party-"communists", is a united front with capitalism, which can only be a united front for capitalism. Where is no use in scolding Moscow, there is no sense in criticizing the socialists: both must be fought to the end. But now, the revolutionary workers must recognize that also the anarchist leaders, that also the "apparatchiks" of the CNT and FAI oppose the interests of the workers, belong to the enemy camp. United with capitalism they had to serve capitalism; and where phrases were powerless, betrayal became the order of the day. Tomorrow they may be shooting against rebelling workers just as the "communist" butchers of the "Karl Marx Barracks" shoot today. The counter-revolution extents all the way from Franco to Santillan. Once more, and so often before, the disappointed revolutionary workers denounce their cowardly leadership, and then they look around for new and better leaders, for improved organization. The "Friends of Durrutti" split away from the corrupted leaders of the CNT and FAI in order to restore original anarchism, to safeguard the ideal, to maintain the revolutionary tradition. They have learned a few things, but they have not learned enough. The workers of the POUM are deeply disappointed in Gorkin, Nin and Company. These Leninists were not leninistic enough, and the party members look around for better Lenins. Whey have learned, but so little. The tradition of the past hangs like a stone around their neck. A change of men and a revival of the organization is not enough. A communist revolution is not made by leaders and organizations; it is made by the workers, by the class. Once more the workers arehoping for changes in the "People's Front", which might after all bring about a revolutionary turn. Caballero, discarded by Moscow, might come back on the shoulders of the UGT-members, who have learned and seen the light. Moscow, disappointed in not finding the proper help from the democratic nations, might become radical again. All this is non-sense! The forces of the "People's Front", Caballero and Moscow, are unable, even if they wanted, to defeat capitalism in Spain. Capitalistic forces can not have socialistic policies. The People's Front is not a lesser evil for the workers. It is only another form of capitalist dictatorship in addition to Fascism. The struggle must be against capitalism. The present attitude of the CNT is not new. A few months ago the Catalan president Companys said that the CNT "has not thought of impairing the democratic regime in Spain, but stands for legality and order". Like all other anti-fascist organizations in Spain, the CNT, notwithstanding its radical phraseology, has restricted its struggle to the war against Franco. The program of collectivization, partly realized as a war necessity, did not impair capitalist principles or capitalism as such. Insofar as the CNT has spoken of a final goal, it suggested some modified form of state capitalism, in which the trade union bureaucracy and its philosophical anarchist friends would have the power. But even this goal was only for the distant future. Not one real step in this direction was undertaken, for one real step towards even a state capitalist system would have meant the end of the People's Front", would have meant barricades in Catalonia and a civil war within the civil war. The contradiction between its "theory' and its 'practice' was explained by the anarchists in the manner of all fakers, that 'theory is one thing and practice another, that the second is never so harmonious as the first". The CNT realized that it had no real plan for the reconstruction of society; it realized further, that it did not have the masses of Spain behind itself, but only a part of the workers in one part of the country, it realized its weakness, national as well as international, and its radical phrases were only designed to conceal the utter weakness of the movement in the conditions created by the civil war. There are many possible excuses for the position the anarchists have taken, but there is none for their program of falsification which beclouded the whole labor movement and worked to the advance of the Moscow-Fascists. Trying to make believe that socialism was on the march in Catalonia and that this was possible without a break with the People's Front Government meant the strengthening of the People's Front forces till they were able to dictate also to the Spanish anarchist workers. Anarchism in Spain accepted one form of fascism, disguised as a democratic movement to help to crush Franco-Fascism. It is not true, as the anarchist today try to make their followers believe that there was no other alternative, and hence that all criticism directed against the CNT is unjustified. The anarchists could have tried, after July 19, l936, to establish worker's power in Catalonia, they could also have tried to crush the Government forces in Barcelona in May 1937. They could have marched against both the Franco-Fascists and the Moscow-Fascists. Most probably they would have been defeated; possibly Franco would have won and. smashed the anarchists as well as his competitors of the "People's Front". Open capitalist intervention might have set in at once. But there was also another possibility, though much less likely. The French workers might have gone farther than to a mere stay-in strike; open intervention might have led to a war in which all the powers would have been involved. The struggle would have at once have turned on clear issues, between Capitalism and Communism. Whatever might have happened, one thing is sure: the chaotic condition of world capitalism would have been made still more chaotic. Without catastrophes no change of society is possible. Any real attack on the capitalist system might have hastened reaction, but reaction will set in anyhow, even if somewhat delayed. This delay will cost more workers' lives than would any premature attempt to crush the system of exploitation. But a real attack on capitalism might have created a condition more favorable to international action on the: part of the working class, or it might have brought about a situation which would have sharpened all capitalist contradictions and so hastened historical development toward the breakdown of capitalism. In the beginning is the deed. But the CNT, we are told, felt so much responsibility for the lives of the workers. It wanted to avoid unnecessary bloodshed. What cynicism! More than a million people, have already died in the civil war. If one has to die anyway, he might as well die for a worthy cause. The struggle against the whole of capitalism - that struggle which the CNT wanted to avoid - can not be avoided. The workers' revolution must be radical from the very outset, or it will be lost. There was required the complete expropriation of the possessing classes, the elimination of all power other than that of the armed workers, and the struggle against all elements opposing such a course. Not doing this, the May days of Barcelona, and the elimination of the revolutionary elements in Spain were inevitable. The CNT never approached the question of revolution from the viewpoint of the working class, but has always been concerned first of all with the organization. It was acting for the workers and with the aid of the workers, but was not interested in the self-initiative and action of the workers independent of organizational interests. What counted here was not the revolution but the CNT. And from the point of view of the interests of the CNT the anarchists had to distinguish between Fascism and Capitalism, between War and Peace. From this point of view, it was forced to participate in capitalist-nationalist policies and it had to toll tell the workers to cooperate with one enemy in order to crush another, in order later to be crushed by the first. The radical phrases of the anarchists were not to be followed; the only served, as an instrument in the control of the workers by the apparatus of the CNT, "without the CNT", they wrote proudly, "anti-fascist Spain cannot be governed". They wanted to participate in governing the workers and ordering them around. They only asked for their proper share of the spoils, for they recognized that they could not very well have the whole for themselves. Like the 'Bolsheviks", they identified their own organizational needs with the needs and interests of the working class. What they decided was good, there was no need for the workers to think and decide for themselves, as this would only hinder the struggle and create confusion; the workers simply had to follow their savers. Not a single attempt to organize and consolidate real working class power. The CNT spoke anarchistically and acted bolshevistically, that is, capitalistically. In order to rule, or participate in the rule, it had to oppose all self-initiative on the part of the workers and so it had to stand for legality and order and government. But there were more organizations in the field, and there is no identity of interests among those organizations. Each one is struggling against all others for supremacy, for the sole rule over the workers. The sharing of power by a number of organizations does not do away with the struggle between them. At times all organizations are forced to cooperate, but this is only a postponement of the final reckoning. One group must control. At the same time that the anarchists were proceeding from "one success to the other", their position was continuously being undermined and weakness. The CNT's assertion that it would not dictate to other organizations, or work against them, was in reality only a plea not to be attacked by others - a recognition of its own weakness. Being engaged in capitalist policy with its allies of the People's Front, it left the broad masses with the possibility of choosing their favorite from among the bourgeois elements. The one who offered the most had the best chance. Moscow fascism came into vogue even in Catalonia. For the masses saw in the support of Moscow the strength necessary for doing away with Franco and the war, Moscow and its People Front government meant international capitalist support. Moscow gained in influence, for the broad masses of Spain were still in favor of the continuation of the exploitation society. And they were strengthened in this attitude by the fact that the anarchists did nothing to clarify the situation, that is, to show that help from Moscow meant nothing more than the fight for a capitalism which pleases a few imperialist powers,even though it may disappoint others. The anarchists became propagandists for the Moscow brand of fascism, the servants of those capitalist interests which oppose the present Franco plans in Spain. The revolution became a play ground of imperialist rivals. The masses had to die without knowing for whom or for what. The whole affair ceased to be the affair of the workers. And now it has also ceased to be the affair of the CNT. The war may be ended at any time by a compromise agreement between the imperialist powers. It may be ended with a defeat or with a success of Franco. Franco may drop Italy and Germany and turn to England and France. Or the former countries may cease to pay further attention to Franco. The situation in Spain might be decisively altered by the war brewing in the Far East. There is still a number of possibilities in addition to the most likely one, that is, victory for Franco-Fascism. But whatever happens, unless the workers throw up new barricades against the Loyalists also, unless the workers really attack capitalism, than whatever may be the outcome of the struggle in Spain it will have no real meaning to the working class, which will still be exploited and suppressed. A change in the military situation in Spain might force Moscow-Fascism once more to don the revolutionary garb. But from the viewpoint of the interests of the Spanish workers, as well as of the workers of the world, there is no difference between Franco-Fascism and Moscow Fascism, however much difference there may be between Franco and Moscow. The barricades, if again erected, should not be torn down. The revolutionary watchword for Spain is: Down with the Fascist s and also down with the Loyalists. However futile, in view of the present world situation, might be the attempt to fight for communism, still this is the only course for workers to adopt. "Better the sense of futility than the morbid energy that expends itself on false roads. We will preserve our sense of truth, of reason at all cost, even at the cost of futility."